Trainer Bill Spawr's Midnight Bisou seeks her third consecutive graded victory as she heads of field of nine sophomore fillies going 1 1/16 miles in Saturday's Grade I, $400,000 Santa Anita Oaks. 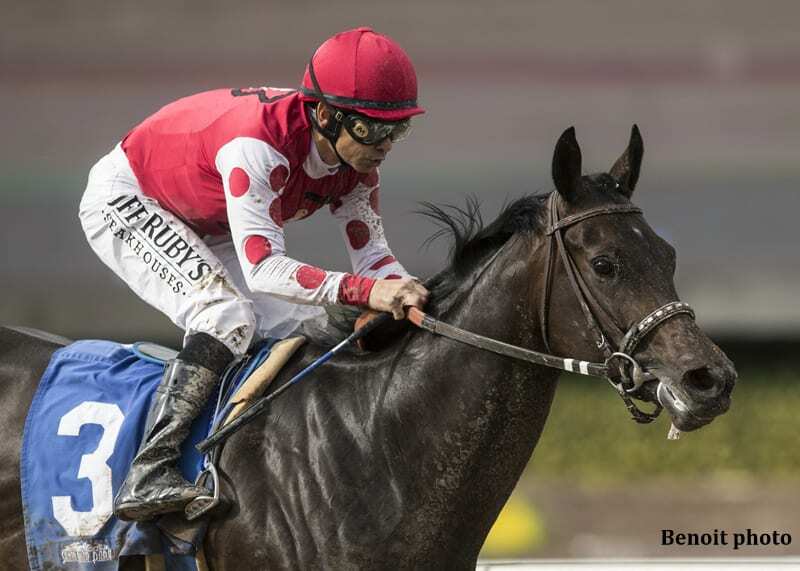 A winner of the Grade II, seven furlong Santa Ynez Stakes on Jan. 7, Midnight Bisou then romped by 2 ¼ lengths in her first two turn assignment, the Grade III Santa Ysabel at 1 1/16 miles on March 3. Midnight Bisou's primary competition would appear to come from Bob Baffert's Thirteen Squared, who was second in the Santa Ysabel, John Shirreffs' Spring Lily, who dueled early and was then a distant third in the same race and Phil D'Amato's Spectator, who comes off a second condition allowance win sprinting. Two noses away from being unbeaten in four starts, this daughter of Midnight Lute won with aplomb when stretched out for the first time on March 3, earning a career best 94 Beyer Speed figure, which is easily the best Santa Anita Oaks “last-out” fig. With Mike Smith once again at the controls and the distance the same as it was in her Santa Ynez romp, it would appear to be conditions to order for her as she readies for her career close-up. Although no match for Midnight Bisou, she disposed of Spring Lily following an early duel, outrunning her for second money in the Santa Ysabel by eight lonely lengths. By the Indian Charlie stallion Liaison and out of Zetcher's Free House mare House of Fortune, Thirteen Squared, who has one win from six starts, adds heat to any early pace scenario. Lightly raced, this Kentucky-bred daughter of Union Rags rocketed to a five length maiden score going 6 ½ furlongs two starts back and has every right to improve off of her third place finish in the Santa Ysabel on March 3, which was her first two turn assignment. Bred in Kentucky by Emily Wygod, she's out of the Bertrando mare Taro. Ridden by Evin Roman in her last two starts, she'll be handled for the first time on Saturday by Victor Espinoza. A winner of the Grade II, 6 ½ furlong Sorrento Stakes in her second start on Aug. 5 at Del Mar, this Kentucky-bred filly by Jimmy Creed was subsequently third in the Grade I, seven furlong Del Mar Debutante two starts back Sept. 2 and she comes off a gutty neck victory in a 6 ½ furlong allowance here on March 18. A winner of three out of her four starts, she'll be trying a route of ground for the first time in the Oaks and will be ridden for the first time by Javier Castellano. First post time for a 13-race card on Saturday is at 11:30 a.m. Admission gates will open at 10 a.m. For additional information, please visit santaanita.com. This entry was posted in Racing and tagged Bill Spawr, Horse Racing, midnight bisou, santa anita, Santa Anita Oaks, Thirteen Squared by Mike Willman/Santa Anita. Bookmark the permalink.